OK so here's the straight skinny about Lithium ion batteries and storage vs state of charge. To start with, the Lithium technology used by Sony is licensed from a company named AEA (ref 2). AEA manufactures mil spec batteries for aerospace and the like. Sony has a license for terrestrial use. Camcorder batteries are manufactured by Sony (ref 1) using a lithium oxide cathode and a carbon based anode. Lithium ions travel through a non aqueous medium during charge and discharge. These batteries have a half life of about 1000 charge cycles (50% charge retained at 1000 charge/discharge cycles). Lithium batteries retain their state of charge (10% loss per month) much longer than earlier technologies partially because a thin passivating layers forms on the electrode surfaces. (ref 3) The chemical composition of the passivating layer varies with battery construction chemistry ( a deep dark secret ). The presence of a passivating layer can be problematic if it grows to more completely block the anode and/or cathode. Passivation thickness increases with increased storage time, temperature, and state of charge. The presence of a passivating layer ( essentially a high resistance) always results in a voltage dip from the battery when a load is applied. (see chart in ref 3) The magnitude and period of the dip is a function of the passivation thickness. The layer thickness is decreased as a function of coulombs transferred from the battery. This layer forms every time you stop using a battery. The layer is removed every time you use the battery. In Camcorder use if the voltage drop is great enough, the camcorder will shut itself off. This is a normal function in camcorder electronics. If this does happen, the passivation layer can be removed by putting a pure resistive load on the battery until the passivation layer is removed. Choose a resistance value roughly equivalent to the load normally presented by the camcorder. After a short period the passivation layer will be completely removed and the battery will then function normally in the camcorder. Think about these facts until you digest them completely, then never worry again about battery metaphysics. So, does this mean I'm going to partially discharge my batteries before storage? No Way - too much trouble. It's like paying homage to the old NiCd god. Also this uses up some of the batteries 1000 lives. Armed with this understanding I do have a resistor handy, but so far I have never had to use it over a period of about 3 years. 3} www.spectrumbatteries.com/Prod_in/passivation_information.htm There is some information on rechargable lithium and other battery systems online at Cadex, from the book Batteries in a Portable World. The charging time and run-time of the TRV900 with specific Sony batteries is listed in the owner's manual on this page. According to BatteryUniversity.com a lithium battery's expected lifetime is 2-3 years (whether you use it or not), and less if stored above room temperature. Some have lasted longer, but don't expect miracle recoveries if your battery is older than this. You can attempt to fix an InfoLithium battery which has developed passivation by a process of charging and discharging several times. The TRV900 has a built-in battery charger. When the camera is off, but plugged into the AC adaptor, and the battery is on it, the battery will be charging (unless it is already fully charged). When the camera is on and not connected to the AC adaptor, it will run off the battery, eventually discharging it to the point where the low-voltage cutout threshold is reached, where it shuts off. To charge-cycle the battery you: A) With battery attached to the camera, unplug the AC adaptor from the camera, turn the camera on, and leave it on until it shuts off due to low battery. Note: don't leave it in "camera" mode with a tape in, as it will auto-shutoff after 5 minutes in standby. Instead select "memory" mode, or "VTR" mode, where it will not auto-shutoff until the battery voltage drops. Do not put the camera in a padded case when on, as it will get rather warm. B) Having discharged the battery, turn the camera off (leaving the battery attached) and connect AC adaptor. The battery will now charge until it is full. C) Repeat steps (A) and (B) several times. The above method worked for me with two NP-F330 batteries that had develped passivation due to several months of non-use. If after several tries the battery still dies prematurely, then you have to adopt another method, see below. The TRV900 uses a 7.2 V battery and consumes between 3.9 to 5.2 watts of power depending on operating mode. That implies between 540 mA and 720 mA of current, which would be drawn by a resistor ranging from 13.3 ohms to 10.0 ohms. So, you can simulate this load with a 10 ohm resistor rated to handle at least 5 watts (If possible, I'd suggest 10 W or more). Unless you use a physically large resistor, after a short time under load the resistor will get very hot and can burn you so be careful. The tricky part is how long to drain the battery with the resistor, as running the battery "flat" may well do more harm than good. If the battery is really fully charged, then you should leave the resistor on as long as the "continuous recording time" for the camera drawing that current. A 10-ohm resistor corresponds to using the LCD screen, and a 13 ohm resistor to using the viewfinder. For example, a charged NP-F330 battery with a 10 ohm resistor load should take 50 minutes to discharge, while the NP-F750 should take 220 minutes. Runtime is listed for all operating modes and battery types in your owner's manual. That page is also online here. I owned a TRV900 since early 1999 and the unit is very good except I experienced problem with the Lithium batter which dropped dead in about 10 minutes with a full charge. From your posting, I built a very simple discharger with an indicating light and would like to share this with all users. The cost to built this discharger is slightly over $10 and I think its worth to have the convenient to watch over it when the battery is discharging. The connecting pin is usually a part on a TV chassis for connecting between the chassis and the DY assembly. I got this through my profession. Other users might use similar PCB mount pin. Hope the attached photos give a easier way to discharge the battery. Note from J.Beale: the photo shows the light bulb in series with the 10 ohm resistor. The DC resistance of this particular light bulb (12 V / 60 mA) is around 200 ohms so it limits current to a "trickle drain". You could also connect the light bulb in parallel with the resistor, permitting current draw more like the camcorder uses. My infamous battery is finally responding to my efforts. I can happily report that it's up to 45 minutes useful capacity after two applications of the Resistor Discharge method and several follow up charge/recharge cycles in the camera. It appears after over a week of experimentation that the resistor method is far more effective than camera discharge/recharging, at least in the case of this battery that was down to 5-7 minutes of useful capacity when I started. I decided to see if a second drain with the resistor would offer even greater improvement. It indeed has. My battery continues to improve, and I now plan to regularly rejuvenate my batteries with periodic full discharges with the resistor method. I have found that the battery should be fully charged before the resistor discharge, and that rather than timing the discharge procedure, I can effectively monitor the progress by simply placing a finger on the resistor every five minutes or so after the first hour of discharge. The resistor gets very hot initially, but as the battery nears the fully drained state the temperature falls rapidly. I keep the resistor in the battery until it has returned to ambient temperature for about five minutes. I find that after this procedure the battery will show 2-3% charge when I start the recharging process. I would like to thank John Beale and others who have suggested the basic methodology that got me started. The process has made me a firm believer in fully draining my lithium ion batteries with a resistor periodically. Note: Several people on the TRV900 mailing list reported that they have "killed" Sony lithium batteries by leaving them on the camera while it was plugged in to the wall over a period of months (eg. with the camera used for desktop editing purposes). I recommend removing the battery when using the camera on AC line power. The Cadex battery book mentioned above notes that Li batteries often fail after 2 or 3 years even if not used, and recommends rotating batteries instead of storing them. If batteries are stored, aging is minimized by leaving a 40% state of charge, and maintaining the battery at 15 deg. C.
Overall I am impressed with Sony batteries. 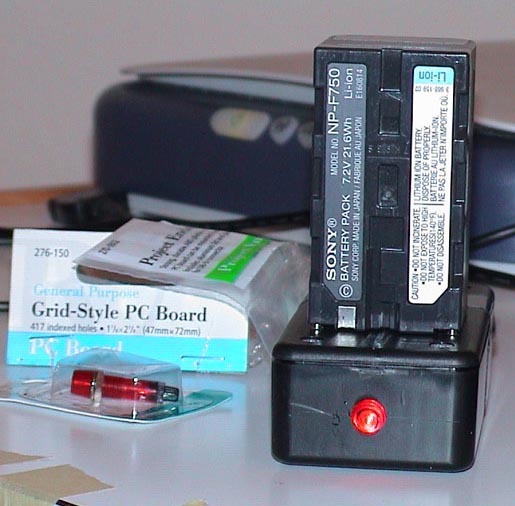 I bought a Sony NP-F750 battery along with my TRV900 in Sept. 1998. In March 2002, I measured the runtime of this battery to be 84% of the original Sony specified capacity after 3.5 years of frequent use and recharging, and room-temperature storage. I think this is excellent performance. Stumbled across your page explaining how to restore a "dead" InfoLithium battery. Very interesting! As an electronics engineer, I did exactly the same (discharge via resistor) before knowing your page. The electronics contained in the battery features an over-discharge protection, so it cuts off the flow of current at a specific voltage. I didn't care about how long my resistor remained connected. At a certain time the voltage across the resistor becomes zero, but as soon as you remove the load, the battery voltage returns to 2.x volts (don't remember the exact value). 1-2 years ago I was in touch with a guy in Germany who actually succeeded in decoding the initial InfoLithium data stream which the camera must receive. 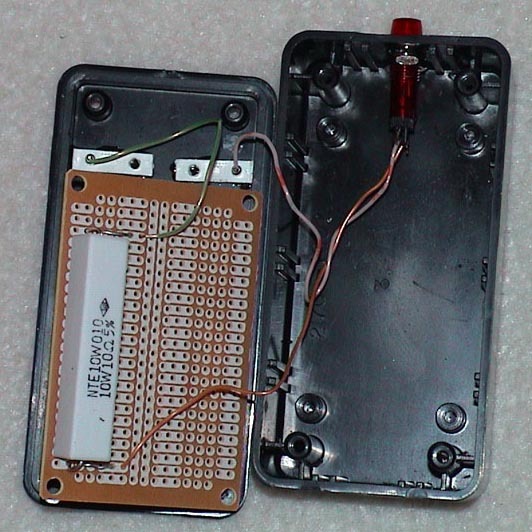 He then wanted to build a fake InfoLithium transmitter using a PIC microcontroller. But the effort is high, much higher than for the combi solution (see link above). Have 3 NP-FS11, 2 of them half dead. Will open one of them and attach nice big Sony US18650GR cells I recovered from a dead Compaq notebook. They have 1500mAh each. I have restored my battery by using the instructions provided by John and others with one extra step. I first attempted to drain the battery and charge it using the camera itself. I found that after four attempts I wasn't getting anywhere. 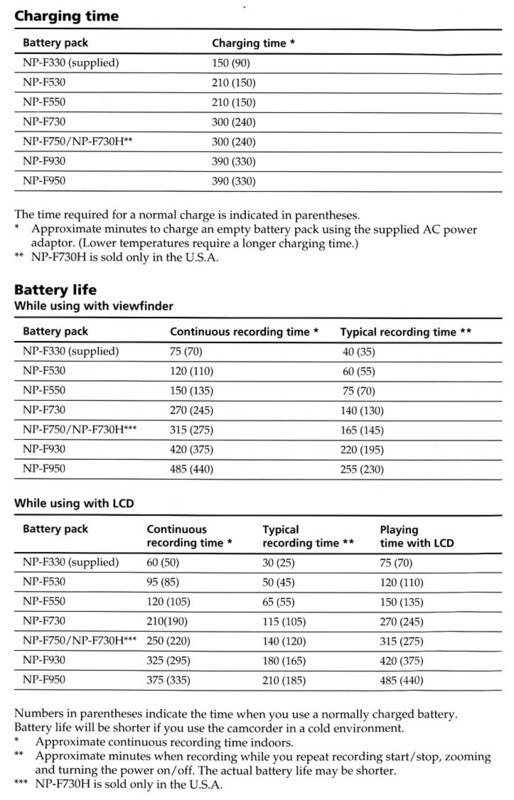 I have a NP-F550 battery that would die in 6 minutes. When placed in the camera to charge the charge time would jump from nothing to 180 minutes and then go up from there. I decided to go the to secondary charge method and picked up a 10ohm 10watt resistor. This method too seemed to kill the battery in about 6 minutes and I got the same result when putting the battery back on the camera to charge - no display at first then a jump to 180 minutes. I thought I would see what would happen if I were to immediately remove the battery from the camera after the 180 minutes appeared without letting the battery charge - then put the resister across the terminal. Oddly enough the resistor got hot for 10 minutes and then went cold again. When I placed the battery back onto the camera it was blank at first and then showed 170 minutes! I took it off immediately and put the resistor back until it was cool and then slapped it on again - each time the battery charge indicator showed a lower charge amount. I repeated the process until the battery indicator was nil and then gave the battery a full charge. It now works as it should. Thanks for saving me $80!